Whether it is temporary or lifelong, it is not at all unusual for a toddler to follow a vegetarian diet. In some cases, it may be because your child is being raised in a vegetarian household. 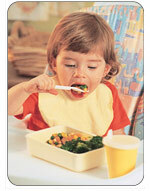 For other toddlers, eating a vegetarian diet may result from their pickiness about food. Contrary to what some people may believe, raising a child with a vegetarian diet is not at all unhealthy so long as parents take care to make sure that all the appropriate nutrients are met. Some benefits to a lifelong, proper vegetarian diet include a lower risk of heart disease, high blood pressure, diabetes and obesity. The main problem with vegetarianism and toddler nutrition is making sure your child gets enough nutrients and calories. Calorie consumption is important for ensuring your toddler has enough fuel for all that energy. A common concern for many parents is coming up with a toddler menu that provides enough protein and iron. While there are many sources of protein and iron found in foods other than meat, it often takes a larger quantity of the non-meat source to provide the same amount of protein or iron as a serving of meat. Since toddlers already have such a small appetite, it can be difficult to get them to eat enough vegetables or beans to receive all of their nutrients. Therefore, it is important that vegetarian children are served foods that pack the most nutritional punch. If your toddler is following a lacto-ovo vegetarian diet (this is one that allows milk and eggs), then dairy and cheese products can usually provide your little one with enough protein. However, if you’re feeding your toddler a vegan diet (one that does not allow any animal products), milk and cheese aren’t options. Soybeans and tofu are a great source of protein for adults and children over four. For toddlers, though, it shouldn’t be used as their main source of protein. This is because it lacks enough methionine, a protein that contributes to healthy growth. Instead, compliment the tofu or soybeans that you serve with soymilk that has been fortified with vitamins and minerals. Not only will this help provide some protein, it will also help your toddler’s nutrition by providing calcium, and vitamins A and D, which can often be hard to get in a vegan diet. Iron can be found in many vegetarian friendly sources. Kidney beans, lima beans, green beans, spinach and egg yolks are all excellent sources of iron. However, unlike iron derived from animal sources, iron from vegetables can be hard for your body to absorb properly. But serving a vitamin C rich food with those beans or spinach can make the iron easier for your toddler to absorb. Some great sources of vitamin C include tomatoes, oranges, broccoli, red peppers, and cantaloupe. While it is possible to raise a healthy vegan, it can take a bit more work. You may need to give your toddler more supplements to make sure they get all the nutrition that they need. B12 can be especially difficult for vegans to get enough of. While vegetables contain some B12 vitamins, the body does not easily absorb these. Talk to your child’s health care provider about getting a B12 supplement that is suitable for toddlers. A diet that does not allow for calcium can also be detrimental to your child’s health. Calcium helps to make bones stronger and aids in proper growth and development. It is recommended that children regularly drink milk until they are teenagers. However, if you do not want your child to drink milk, then buy fortified soymilk. Make sure, though, that it is fortified with calcium as well as the other nutrients that your toddler needs for good nutrition. Regardless of whether your raising your child as a vegan or as a vegetarian, it is a good idea to talk to your toddler’s health care provider about the necessity for a vitamin and mineral supplement. Get more toddler eating tips in our forum.